Now this is what a bicycling city looks like. Patrick Pascal forwards today’s photo from Dublin, Ireland, noting the city is besmirched with bikes these days. Although women apparently don’t feel safe bicycling there, despite the safety in numbers. Pretty much like every other major city, Los Angeles included. Here’s a good suggestion from someone who prefers to remain anonymous. Now that LeBron James is officially a Laker, the Los Angeles bike community should welcome him by riding with him from his Brentwood home to Staples Center for his first home game. That would give a lot of LA kids a chance to ride a bike with the man known universally as King James. Something he clearly cares deeply about. It would also give us the chance to call attention to the lack of safe infrastructure and the dismal state of LA streets. And make sure he gets there in one piece. So if anyone out there knows LeBron, just have him get in touch with me and we’ll put something together. I’ve long been a fan of the East Side Riders Bike Club, and their mission to use bikes to change lives and improve the Watts community. Now they’re asking for your help to raise $20,000 to support that vital work. Here’s what their crowdfunding page has to say. The East Side Riders Bike Club (ESR) is an all-volunteer, grassroots bicycle club working to prevent youth from joining gangs and/or taking drugs, but also engage youth to enrich the community through recreational activities, Our kids are introduced to bike safety, healthy eating and active living, the importance of giving back to the community, and are able to participate in community riding events hosted by ESR. ESR seeks to positively impact the following community needs: Inadequate Organized Recreational Outlets for local youth in the Watts area, a community that is rife with high rates of child obesity, asthma and other respiratory challenges amongst youth; lack of Safe Passage and Travel Routes: while Watts is a very small community, there are clear gang-related boundaries and territories that limit the movement of local youth based on where they reside; Lack of Resources- families lack the resources to purchase bikes, safety gear, and/or other necessary equipment. In turn, these kids feed the homeless, clean up neighborhood parks, and are learning to solve community problems by working together! 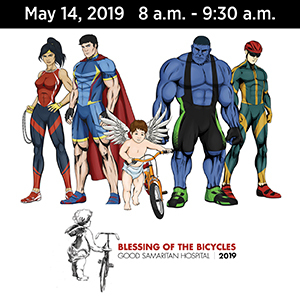 East Side Riders is raising money to help support our Organization, the BEAST Class and our overall continued support of ESRBC. Since 2008 ESR has provided sack lunches to the hungry, fixed kids bikes for free and provided meals for Thanksgiving, toys and food for Christmas including bikes and helmets for kids that really need them. With your donation you would be helping our yearly budget that is partially paid for through grants. You can also donate you time to ESR by volunteering with our organization and spreading the word about our work. If you’ve got a few extra bucks lying around, it would be hard to find a better cause to support. 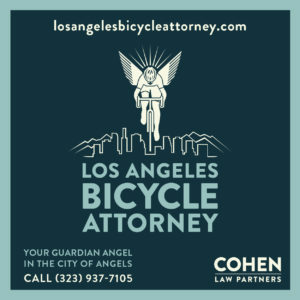 Yes, LA Councilmembers Mike Bonin and Bob Blumenfield are considering bringing back mandatory, or possibly voluntary, bicycle licensing, though they swear it won’t be used to harass riders, unlike the city’s previous, unlamented program. You can get all the benefits of bike registration right here for free, without waiting for the city to make up its mind. LA County is proposing an ambitious plan to make over a long-overlooked area near Harbor-UCLA Medical Center into a bike and pedestrian friendly neighborhood. 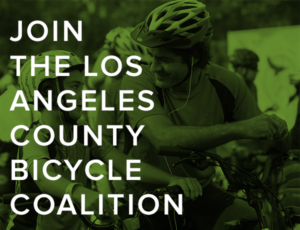 Curbed considers Pasadena’s plans to bail on its money-losing Metro Bike program. Maybe you can be a paid brand ambassador for bike friendly New Belgium Brewing at Long Beach State, or one of 13 other campuses around the US. An Escondido woman bought a new ebike for a man she calls her guardian angel, who meets her every day to protect her from harassment on a bike path. Victorville wants your input on a grant application for new bike lanes. Sad news from San Francisco, where a pedicab driver has died two weeks after he was run down by a hit-and-run driver; Bay Area bicyclists are angry over the crash on the Embarcadero, which was supposed to get a protected bike lane. Bicycling offers more of their click-through clickbait, with six roads throughout the US you “gotta” ride. For once, a local road made the list, with Yerba Buena Road through LA and Ventura Counties. Red Bull offers a beginner’s plan to take you from your couch to riding a 30 miler in just eight weeks. Now that’s a group ride. Up to 10,000 bike riders are expected to turn out for the annual two-day Seattle to Portland Bicycle Classic. Denver bike and pedestrian advocates tell the mayor to put the city’s money where his mouth is, and back his ambitious infrastructure plans with enough money to build it. He gets it. In a very tongue-in-cheek letter, a Colorado man calls on the local paper to stop covering up the thousands of motorist deaths caused by reckless pedestrians and cyclists, some of whom must be members of MS-13. A well-known Iowa oncologist is recovering from multiple broken bones after touching wheels with another rider in a paceline. 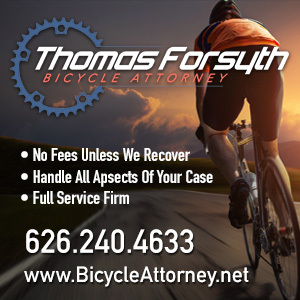 Police in Grand Rapids, Michigan are testing a new ultrasonic radar device that measures the distance between a bike rider and a passing car to look for violations of the three-foot passing law. I like this guy already. A Massachusetts columnist complains about the roadway caste system that puts drivers above bike riders, and suggests that people should park and watch other drivers before they complain about people on bicycles. In the wake of a Baton Rouge, Louisiana, city councilman’s death while riding in a nearby parish, local leaders form a victim-blaming committee that may try to restrict riders rather than improving safety. The City Fix says more bike riders corresponds to a happier city, but does not guarantee you’ll be happy if you ride a bike. It’s the battle of the Parisian bikeshares, as the city’s vaunted Vélib‘ bikeshare has fallen on hard times, and several dockless systems struggle to survive. Every Muslim who can is expected to perform the Hajj at least one in their life, but nothing says you can’t do it by bicycle; two Albanian men will be riding six weeks across five countries to make their pilgrimage to Saudi Arabia. Yesterday’s fourth stage of the Tour de France ended in a three-way photo finish..
Bicycling looks at new gear at the Tour. So is anyone other Peter Sagan or Chris Froome wearing their eponymous glasses and helmet? Yes, Americans can still compete in the top levels of pro cycling. Just not the men, apparently. Now you, too, can relive the 1970s cult classic The Warriors, but on two wheels. When it comes to pro cycling, stupidity is in the pain of the beholder. And this is what it looks like when a thief steals your bike in broad daylight. Not to mention how fast it happens.